Last week was a slow one for teams in the EIVA men’s volleyball conference, with only six of the eight teams in action and just six matches total. So today, we’re taking a break from the usual notebook format and will instead give you a recap of each of the six EIVA matches that occured over the last seven days. When Harvard took the floor of Sacred Heart’s Pitt Center last Thursday, it marked 12 days since the Crimson’s last match. 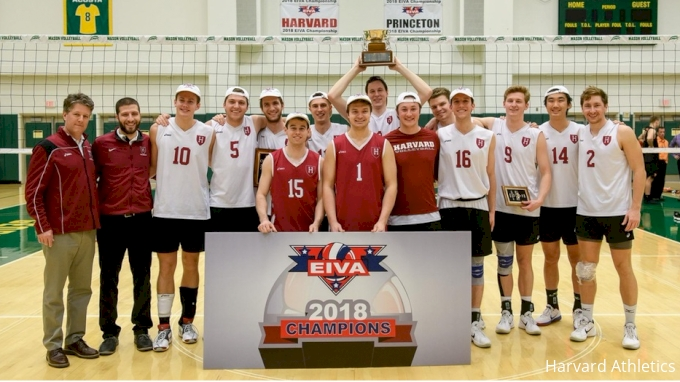 The break must have left Harvard feeling well rested, not rusty, as the team from Cambridge, Massachusetts, earned a W in its first EIVA competition of the year. Harvard’s rookies came up big against Sacred Heart with 6-6 freshman outside hitter Eric Li setting a new season-high with 15 kills while maintaining a .300 hitting percentage, and 6-8 freshman middle blocker Campbell Schoenfeld posting a new career high with four blocks. Junior setter Matt Ctvrtlik finished the match with 34 assists, marking his fourth match in a row with 30 or more helpers, and added five kills and two aces. Sacred Heart, however, won the battle at the net, and with 16 total blocks became the first team this season to out-block Harvard. SHU sophomore Rob Chatterton contributed a match-high six block assists to his team’s defensive efforts. Just under a week after meeting in Charleston, West Virginia, EIVA foes George Mason and Charleston took the floor of the Recreation Athletic Complex in Fairfax, Virginia. This time, instead of letting Charleston escape with a set like it did in the first match between these two teams, George Mason earned the sweep. Senior setter Justin Coleman deserves a significant amount of credit for the win as he led the Patriots to a season-high .444 hitting percentage with 41 assists to match his career high. Coleman’s classmates Kyle Barnes and Langston Payne also starred, with both players recording hitting percentages above .500 (.562 and .545, respectively). Hayden Wagner, the two-time reigning EIVA Offensive Player of the Week, led the match with 13 kills. With the win, George Mason improves to 6-1, its only loss coming at the hands of No. 3 UC Irvine. Charleston, which was led by Maarten Bartels’ 12 kills, fell to 3-4. Penn State celebrated a non-conference win on Friday night when it took down MIVA team McKendree at home in Rec Hall. In the first set, McKendree made PSU work for it, as the Bearcats went on a six-point scoring run after the Lions got set point 24-19, only to have Penn State squeak out the win 27-25. In the second and third sets, Penn State led the entire time and finished the match in straight sets. Penn State hitters Jason Donorovich and Henrik Flack Lauten each had nine kills with Donorovich recording an impressive .750 hitting percentage. Setter Cole Bogner collected 32 assists and led the team to a .286 hitting percentage. Saint Francis had just eight total points fewer than Lindenwood in its 2-3 loss on Friday, but Lindenwood earned the slight edge it needed to win the five-set match. The visiting Lions of the MIVA played a strong defensive match, out-blocking SFU 13 to 12 and out-digging the Red Flash 34 to 26. Saint Francis’ Cole Thompson and Michael Fisher each had 21 kills to tie for the match high. Libero Gabe Woffindin had nine digs to tie Lindenwood’s Adam Brewster for the most on the night. Cole Carver led the victorious Lions with 14 kills, hitting .450. Less than 24 hours after its loss to Lindenwood, Saint Francis earned some redemption with a four-set victory over McKendree. The visiting Bearcats snuck away with the first set, but Saint Francis went on a four-point run to take the lead 5-1 in the second and never fell behind. In fact, the Red Flash held onto that momentum through most of the match, only letting the lead slip away briefly in the fourth set. Second Team All-EIVA outside hitter Michael Fisher set the match high with 20 kills and has now led SFU in kills in each of the last five matches. With 4.64 kills per set, he also tops the conference in that statistical category. The sweep of Lindenwood stretched Penn State’s win streak to three in a row. Freshman opposite Cal Fischer was named the Mike Anderson Man of the Match after leading all players with 12 kills, a new season high for the Pittsburgh native. Jason Donorovich finished the night with seven total blocks (one solo, six assists), while Will Bantle had nine digs. Setter Cole Bogner quarterbacked the team to a .319 hitting percentage, far out-pacing Lindenwood, which only managed a .121 average.